Taq-e Bostan is part of the Tentative list of Iran in order to qualify for inclusion in the World Heritage List. If you want to visit World Heritage Site of Bisotun, Taq-e Bostan is just a short, half an hour detour. It consists of several properties, but the main site is located on the suburbs of Kermanshah and there is a decent hotel in walking distance. The site is very popular with locals, especially during weekends – I walked there on Saturday evening and there was a cloud of smoke from grills nearby. During daylight people come here to take pictures of neighbouring ponds, mountain and the caves. 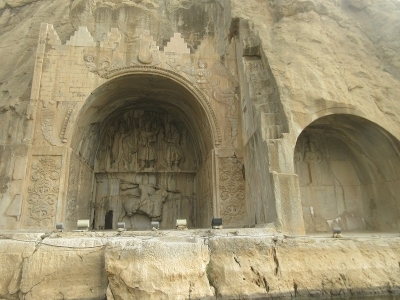 Main site consists of two caves, covered with huge reliefs of Sassanid kings. They were made in 4th century AD and to me are very unique and one of the best examples of Sassanid art of that period. They are very spectacular and there is nothing similar to them on the Iranian WH List. What amazed me is their excellent state of preservation, very unusual for the site dated 15 centuries back. We liked this site a lot and for me it would be an excellent addition to the list (given that there are much smaller and younger reliefs on the list such as Madara Rider, it shouldn't be a problem to inscribe Taq-e Bostan).